SPIETH GOES TWO FOR TWO! To quote Verne Lundquist, and the greatest piece of golf commentary of all time, “Oh, WOW! IN YOUR LIFE, have you seen anything like that?!”. And you know what Verne, we haven’t. 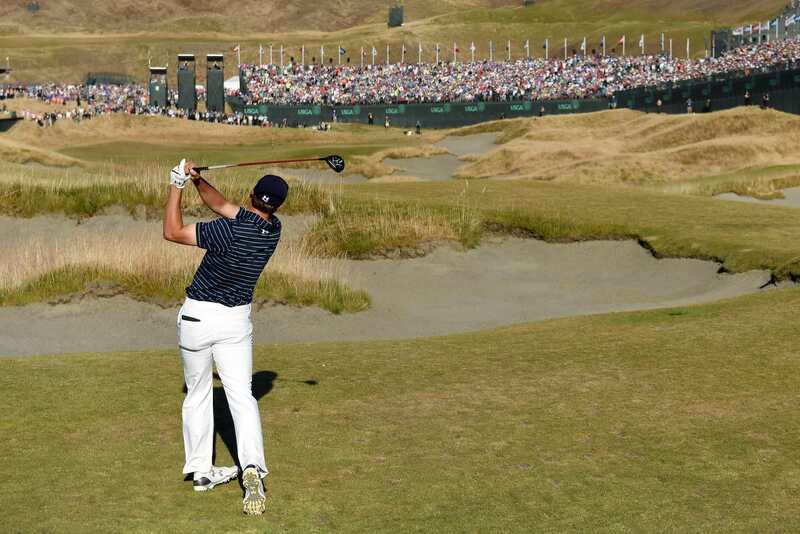 With all the runners and riders having a chance down the stretch, Jordan Spieth survived the US Open to win by one shot, after Dustin Johnson three-jabbed from 12ft on the last, knocking his eagle attempt 5ft by and missing the subsequent birdie putt. Spieth’s one under round of 69 won him his second major of 2015. Two down, and two to play, the grand slam is on , we repeat the GRAND SLAM IS ON! 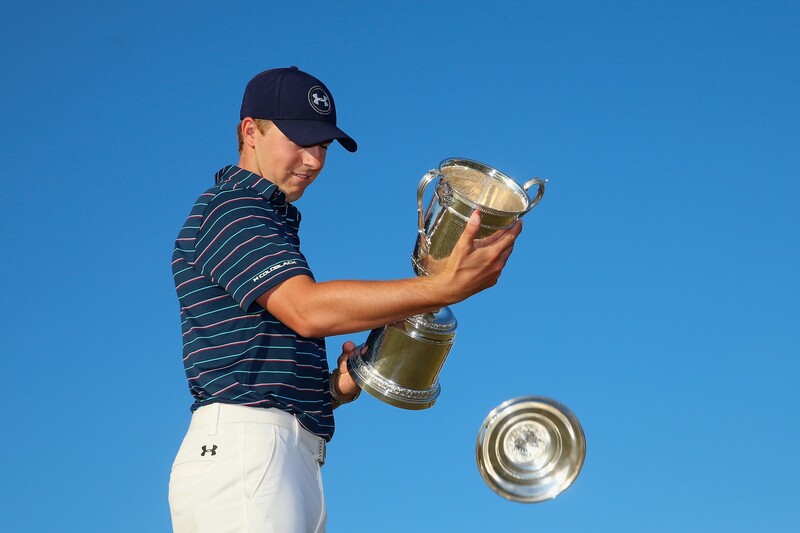 Spieth is the youngest player to win a US Open since Bobby Jones in 1923, the fourth youngest player to win two majors in the same year, and only the sixth player sixth to win the Masters and US Open in the same year. Maybe most impressively he was the first player to win the championship with a birdie on the 72nd hole since Bobby Jones in 1926! Going in to the final round the tournament was up for grabs. With Spieth, Dustin Johnson, Brendan Grace, and Jason Day all tied for the lead at four under, the likelihood was that the winner would come from the final two groups. Early doors though that didn’t look like it was going to be Spieth. A dropped shot on the first took him out of a tie for the lead, but 12 pars and two birdies followed to keep the Under Armour poster boy in with the leaders. Playing the 16th, Jordan was five under alongside South Africa’a Brendan Grace, until Grace hit his only bad shot of the day, inexplicably pushing his tee shot out of bounds. The ball trundled down the train track and resulted in a double bogey. In contrast Spieth curled in a 27ft birdie putt to take the lead at six under for a three shot swing. But golf isn’t that easy. Just as easily as they can give, the golfing Gods can taketh away, as Jordan Spieth made a double bogey on the 17th after a sloppy tee shot and a three putts to bring him back to the field. Refocusing, Spieth didn’t let the occasion faze him, crushing his approach shot from 274 yards with a three wood to 24ft. 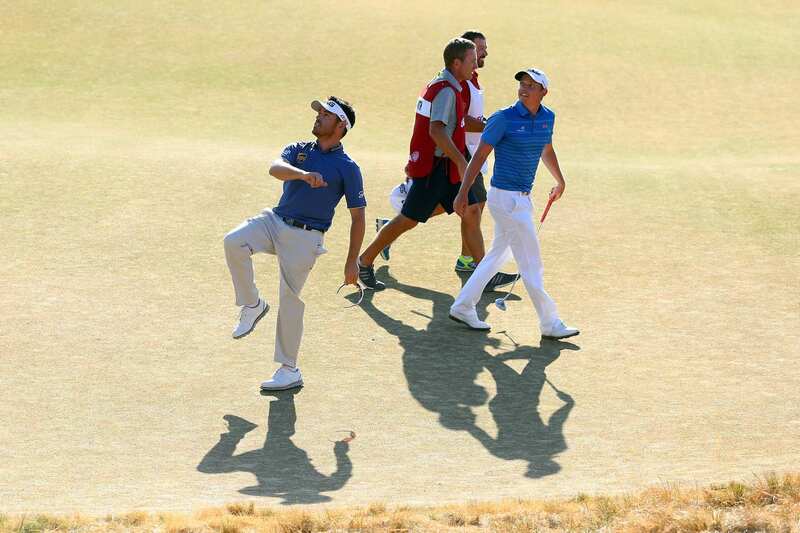 His two putts gave him what would prove to be the decisive birdie. 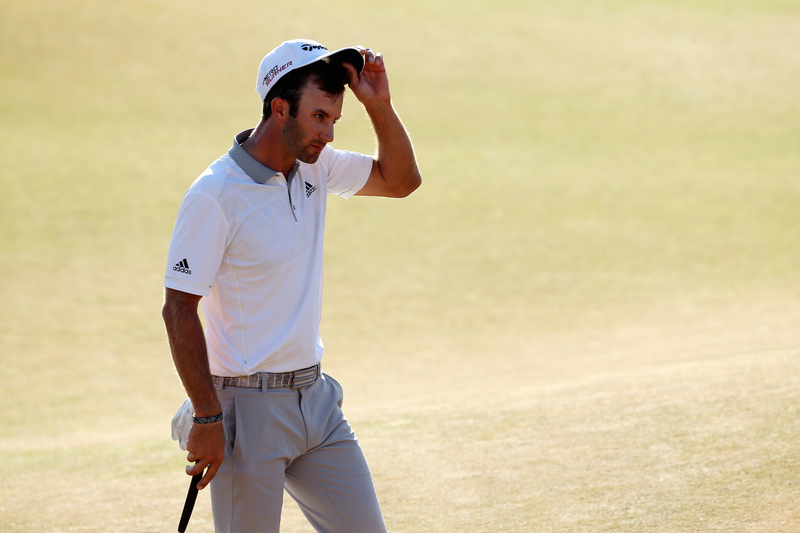 Johnson led the US Open by two at one stage in the final round. Playing in the final group with the people’s choice, Jason Day, Dustin had gone round in just 33 strokes on the front with no blemishes on his card. Yet three bogies in four holes, had put him back at 3 under and in the middle of the pack. A birdie on 17 had put him in a tie for the lead, after Spieth’s sloppy double to create the ultimate Major finish. Dustin Johnson had been unbelievable off the tee this week, and he didn’t disappoint down 18 gunning his drive 360 yards down the middle. Hitting a mid-iron compared to Spieth having to button his three wood, Johnson flushed it onto the right shelf of the green, just 12ft from the hole. His eagle attempt slipped by five feet though, before simply missing the par putt back. Jason Day was the people’s champion this week, he showed unbelievable strength of character to be in contention on the final day. However it all caught up with him on Sunday. Effectively his chances were wrecked after a double bogey on the par four 14th. His 74 and level par four round total wasn’t enough to complete this fairy tale, but Jason Day has proved once again he excels in the tricky conditions of major championship golf. He must win a major, he’s too good not to. Rory said post round “I’m not sure if I've ever hit the ball that well in a major championship". We think he’s right. Unfortunately a cold week with the flat stick meant his final round 66 wasn’t enough to seriously get into contention. 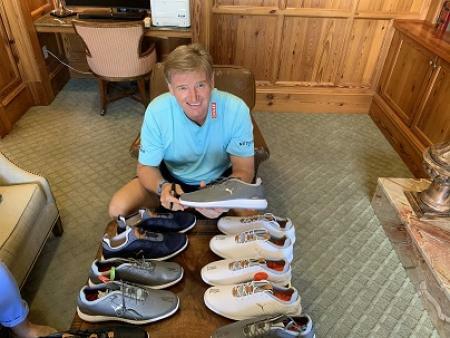 If he gets his putter going we’re looking forward to some fireworks between him and Spieth in July at St Andrews. Clearly the dominant forces in the modern game, Rory won’t have enjoyed having his thunder stolen so far this season. As impressive as Rory was hitting it, Louis Oosthuizen got into a groove Sunday no one else came close to matching. 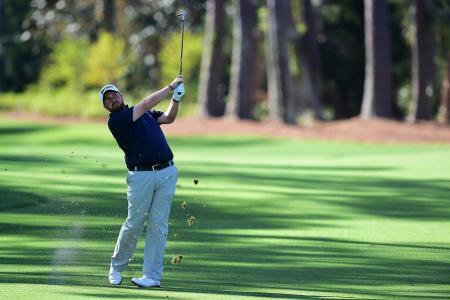 Making six birdies in his final seven holes, Oosthuizen shot 29 on the back to finish four under for the championship. It was only Spieth birdieing the last that stopped him from making a playoff. 20 holes into the championship he was nine over the par. To get 15 strokes back on that over the next 52 holes is extraordinary. Don’t be surprised to see him going blow for blow at St Andrews with Spieth and McIlroy, having won the Open Championship last time it was held in St Andrews back in 2010. Say what you like about Chambers Bay, and whether it was set up correctly, it produced one of the most dramatic major final rounds in years. It was a true test of golf, and the players playing the best golf this week rose to the top of the leader board. While the greens need work, we salute the USGA for making such a bold course selection. Mike Davis, the Executive Director of the USGA received a lot of flack, we say ignore the fuss and stick to your guns. "You can't win them all if you don't win the first two. We'll go to the home of golf prepared to try and win the Claret Jug." St Andrews, we can’t bloody wait!